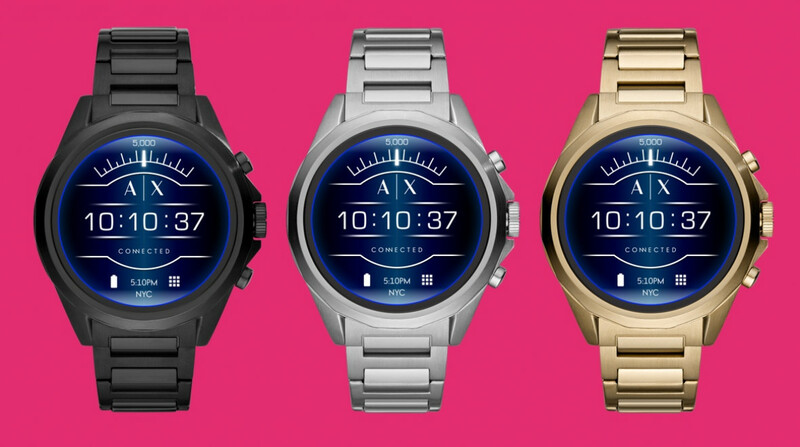 Armani Exchange is set to release its first touchscreen smartwatch, joining sister brand Emporio Armani into the world of Wear OS watches. The company, which lives under the same Fossil Group umbrella as Emporio and other fashion houses, previously dabbled with hybrid smartwatches. Now it has decided to make the jump into more feature-packed wrist wear. In terms of design, the Armani Exchange Connected collection will be offered in four 46mm styles, with link bracelet options in gold, black, silver and coal. As is standard with Wear watches featuring touchscreens, the range will also offer customisable, signature watch faces. But unlike the hybrid Exchange watches we've seen in the past, there's a strong emphasis on true smartwatch features here. Following the trend of other fourth-gen Fossil Group watches, the Connected will feature heart rate monitoring, waterproofing up to 3 ATM (meaning it can withstand water pressures equal to 30 metres, as well as splashes and showers), NFC for contactless payments and GPS tracking for workouts. That waterproofing, as you might suspect, opens the door up to swim tracking through third-party apps, while Google Pay will be your source for contactless payments. There's more, too - Google Assistant on the wrist, notifications and music control. However, battery life is quoted by the company as a fairly average 1-2 days. With Emporio Armani already offering buyers a choice within the touchscreen smartwatch market, it may feel like an odd decision to add another sub-brand into the equation. But with Exchange seen as the more accessible side of Armani (in real terms, that means it's generally cheaper), this could result in a new audience picking up the devices. On the other hand, we're not entirely convinced that the design is well suited to the fitness-focused features packed inside, and the $295 price tag for all variants of the Exchange Connected line (the same as the Emporio Armani Connected range) suggests it won't be a budget option just yet. In any case, we look forward to testing this one out on the wrist itself - even if it means prying the link bracelet off our expanded wrists after a run. And if you're already convinced this is the smartwatch for you, it's available from Armani Exchange and other retailers now.